The fall update for the Xbox 360 dashboard is now Live. The next time you fire up your Xbox 360 consoles you'll be prompted for the update which not only aesthetically changes your dashboard, it'll add a bunch of new features including Netflix Search, Zune Music, ESPN integration, and most importantly for, you know... people that actually use the console to play games - improved voice chat quality. I've been personally using the dashboard for the past two months and can say it's a nice streamlined experience with tweaks abound. The best news for co-op gamers? In the marketplace when looking at games and demos - you can see the number of co-op players supported on every game right next to the features on the first page. You no longer have to dig through a few panels to find it as it's always there for you next to the game's title! 3,500 Sporting Events A Year – Access more than 3,500 live and on-demand global sporting events from ESPN3.com a year, including college basketball, college football and college bowl games, MLB, NBA, international soccer and more. Out of Market Games – Catch your favorite college team games. Check out the huge catalog of out of market games and enjoy them on the big screen. The Best Ways to Watch – Enjoy HD programming, DVR controls, plus access to hundreds of clips from ESPN3.com, refreshed daily. Games at a Glance – Keep up on real-time score information using ESPN.com’s score feed without leaving the game you’re watching. View scores for leagues and games currently in the ESPN.com feed and select “Watch Live” or “Watch Replay” to jump straight into that game. Predict the Winner – Pick what team you think will win. While watching selected games in college football, college basketball, MLB, and NBA, you will be prompted to vote for your team of choice. You’ll also see the percentage of votes among the Xbox LIVE viewing community. Voice Chat – Voice chat with up to seven other friends while watching the big game. My Sports – To customize your ESPN on Xbox LIVE experience, click on the “Events, Highlights and More” slot on the homepage and browse by sport to pick a specific league that you want to follow for the season. The league that you select will now automatically display in your My Sports Channel. Zune Pass – Zune Pass is a monthly subscription service that gives you unlimited, on demand streaming of millions of songs at launch from all the major music labels and thousands of independent labels. Enhanced search – Search the broad library to find your favorite artists, albums, songs and playlists. Social – Connect with like-minded fans on the Zune online community and get new music recommendations. Zune Social also lets you see friend’s Avatars and listen to their recently played songs or check out their favorite artists. Smart DJ – Instantly create customized playlists by selecting an artist and have Smart DJ find songs that complement your selection. Netflix* Search – Experience a streamlined search function making it much easier to find the movies and TV shows you want to watch. Improved voice chat quality – The audio codec is updated to improve Xbox LIVE Party audio quality. So grab your friends and jump into a multiplayer game or catch a big game with friends via ESPN3. 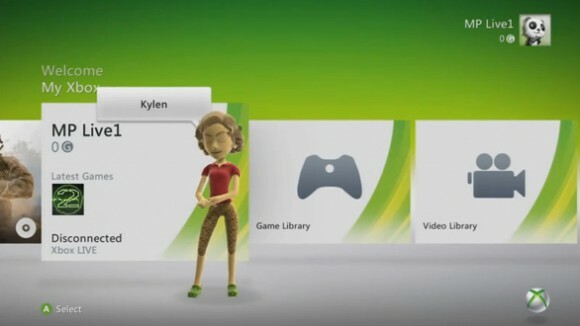 Improved Gamertag creation – Choosing a new Gamertag? If the Gamertag you’re looking for is already taken, your Avatar will spin a wheel and we will provide five other Gamertag suggestions at a time for you to choose from. Streamlined in-dashboard virtual keyboard – We’ve taken the existing QWERTY keyboard in-dash and made it easier to use for scenarios that involve repeated text entry, when signing up for LIVE within the dashboard for example. Improved Xbox LIVE Marketplace UI and browse experience – The Game Marketplace has been re-organized to provide streamlined access to the gaming and video content you want, reducing the number of steps to get to a download. Easier to get on a wireless network – Trying to connect to a wireless network? Now you can see a list of all the wireless networks within range when you go into network settings. From there, you can select a new network or further configure the network you’re connected to. Ability to sign-out other controllers in the sign-in UI – We’re adding the ability to sign-out profiles on other controllers in the sign-in UI within the Guide. This is especially useful when playing games like Rock Band. New browse experience for 100% completed games – You spent a lot of time and effort earning those Achievements, so we’re giving you a new and better way to browse all of them. Family Programming – When turned on, Family Programming disables display of all mature content on the dashboard and can be turned on or off with a protected password for individual members (per account). It also highlights all family-friendly entertainment. Intelligent Default Settings – Your Xbox automatically customizes privacy and activity settings for each member, based on age (child, teen and adult). These settings can later be individually customized. Title Exceptions – Allow your family members to play specific games above the console’s designated ESRB/PEGI (etc.) rating as you deem appropriate. Page created in 0.6166 seconds.